Following the previous article presenting the ULPNode it’s now time to deep into the technique used to setup the starting mechanism of ULPNode bootloader. In this 1st part I’m introducing the goals to achieve and in the 2nd how it has been done with all source code. 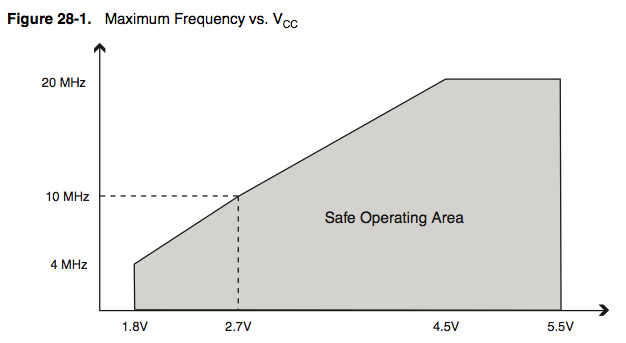 We can see that the only way to be able to work at 1.8V is to set Frequency to 4MHz. So cruising speed of ULPNode will be defined to 4MHz. But don’t worry, ULPNode boards have 16MHZ crystal on board, this mean that if you need to do critical timing or speed operation it will be possible to ULPNode to work at 16MHz. 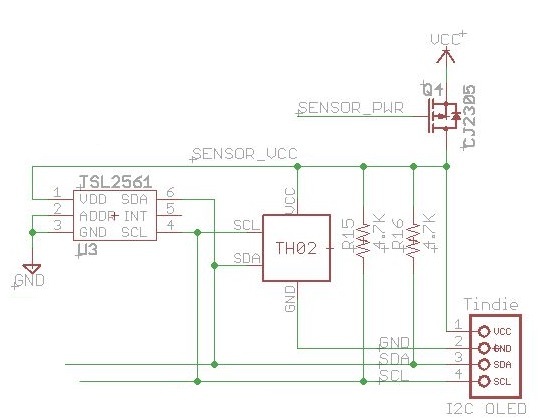 You will just need to be sure to enable the correct hardware to bring Voltage to 3.3V before setting High Speed operation, and once done, cut it off to go back to 4MHz. 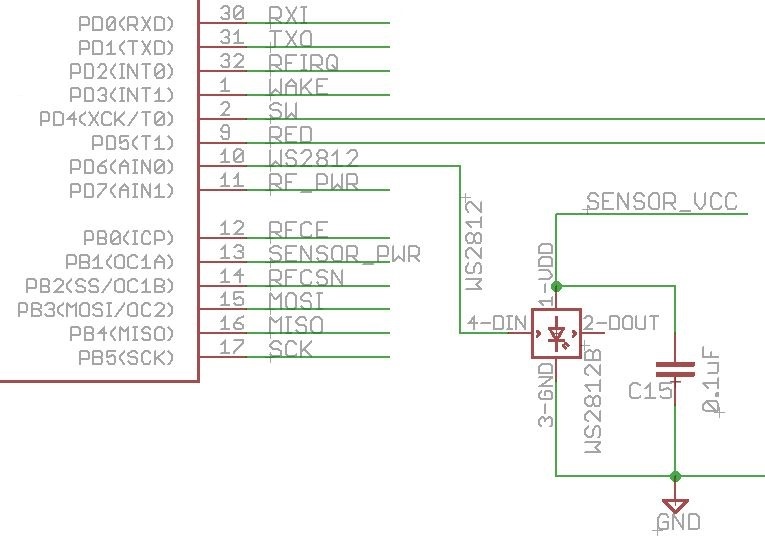 Now that the specifications are defined, we need to prepare them to be understandable by the ATMega328P. This chip has some configuration definitions called Fuses that define how the chip will work and what features we want to use. I will not talk a lot about fuses here, others have already described. Just take a look to Adafruit Fuses tutorial if you want to have more information. As previously said, as ULPNode can run at 1.8V we should not go over 4MHz at startup. This is why we will be using the specific fuse called CKDIV8 which set the clock prescaler to divide the clock by 8. This mean that at startup ULPNode will by default run at 2MHz (16MHz / 8) which is quite on specification. The other point is that we need to be able to do, it’s to increase the clock while into the bootloader because you will see later that we need to get to 4MHz or more. This is quite simple using the functions provided by the compiler, but it has a drawback. The original Bootloader is just under 0.5Kb and as soon as you want to use clock change function size is increasing and can’t be fitted on 0.5Kb (may be it could but as I need to add more things onto the bootloader, never mind, I will use 1Kb bootloader). This is why I used BOOTSZ fuse to 512W_3E00. (512 words, so 1024 bytes of bootloader). This will reduce maximum sketch size by 512 bytes regarding the original optiboot bootloader, but it will not wasted because I will include some code into the bootloader that will be callable from Arduino sketch using advanced features such as vector table. The last fuse I changed (regarding Arduino default fuses) is the SUT_CKSEL to be able to speed up startup and wake up from sleep modes faster. I’ve setup the 0MS startup. As we have BOD enabled, in all cases, the chip will not start above 1.8V and at this point the Crystal Oscillation will be started correctly (well I saw this somewhere in the datasheet). Ok, now let’s continue, what hardware we need to drive into the bootloader? Well first of all, I love LED, they can give you lot of information on what is going on when you debug the code and sometimes on end user to view things (transmitting for example). I know it’s far away from Low Power but you don’t need to enable them. They are on board if you need, that’s all. But one led is not really sufficient, I like to have three (Red, Green, Blue) but this requires 3 I/O pins, and I do not want to use 3 just for LEDs. 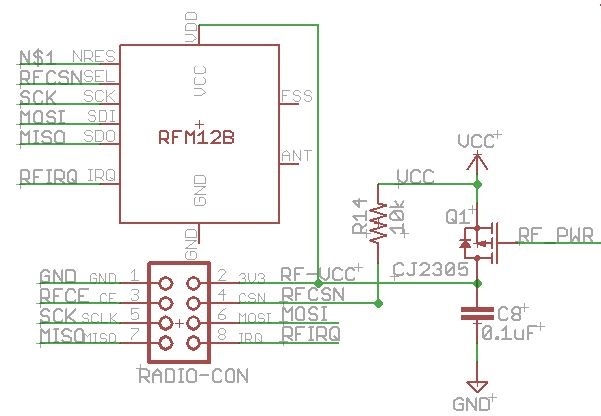 D7 for powering the Radio Module (RFM12B, RFM69, NRF24L01), note that radio modules have sleep mode, so it’s not mandatory to use this powering technique. You can also let the pin low and your radio module always powered using sleep mode, depending on you needs.Once again, if you need it, it’s on board. This one is more new and tricky, this will enable the on board DC booster to activate and thus bring the voltage of the main board to 3.3V. This permit doing all needed harvesting operations in a safe and working voltage range. This is also the mode that permit to bring the clock to 16MHz for example. Once we’re done, we need disable the booster mode. Explanation and schematics of this point will be described later since it also involve other hardware chip than the DC booster. 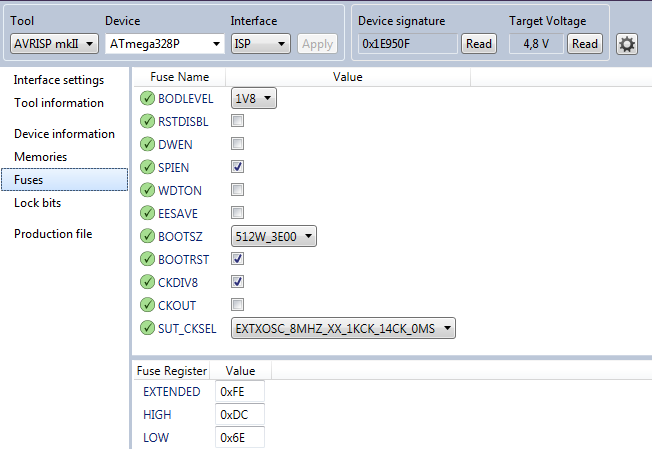 In the next article, I describe the code implemented and the modification done into the original optiboot bootloader. For the fun, just a picture of implementation and testing new bootloader code. 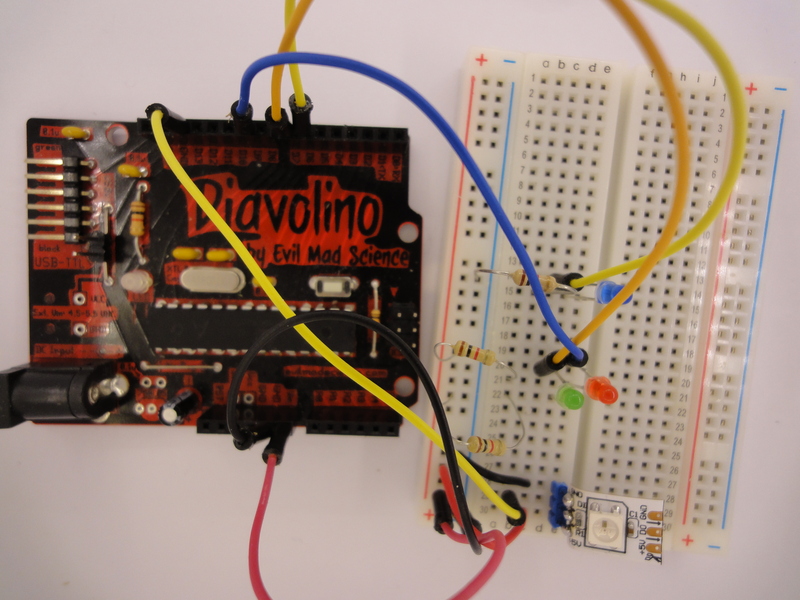 Look at Diavolino board, I love them, nothing more than the chip, crystal, and the LED with a ICSP connector, perfect for testing the LED driver. Huge work done by JC Wippler from jeelabs with jeenodes and some powering techniques. 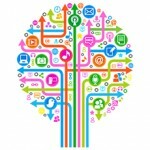 You will find lot of articles on jeelabs site, it’s from my point of view one of the master site reference over the net.